Investing in gooseneck trailer locks is another way to effectively secure your prized heavy-duty gooseneck trailer away from thieves aside from using a good trailer hitch lock or anti-theft wheel locks. However, ​there are just too ​many options available on the market today​. ​Hence, it can be quite challenging to pick which one is the best for your needs. No Time To Read? Click here for the Top Gooseneck Trailer Locks Picks! But fret not, because this is exactly what we're bringing you today. We've​ researched, sifted through ​different models, and compiled the best gooseneck trailer locks available for you to purchase. So sit back, relax, and read on to know more about how you can protect your trailer from those pesky thieves! The Blaylock TL-50 coupler lock fits all gooseneck 2-5/16" style couplers, including most Bulldog, Superior, Stallion and, T.E.M. gooseneck style couplers. Additionally, it boasts an adjustable two-pin placement that lets you use it on your trailer while enjoying an easy custom fit. This gooseneck coupler lock secures using a 3/8" diameter padlock (which is not included, by the way). It is especially designed for RVs, heavy trailers, livestock haulers, and other heavy-duty needs.​ Furthermore, this product features a solid hardened steel rod and high-grade aircraft aluminum as materials. ​To add, its design is also patented for maximum security when leaving a trailer unattended. Lastly, ​the distance between its ears is 4-5/8" at the bottom and 4-7/8" at the top, so make sure to check your trailer to verify if it will fit without problems. The Blaylock TL-50 earned praises for its solid construction that feels just right for heavy-duty needs. ​Many buyers felt more secure about leaving their trailers unattended ​because of its aircraft-grade aluminum body and hardened steel rod. Also, ​the fact that this gooseneck lock is easy to install and take off is another popular feature. ​With that said, if you'd rather not deal with complicated systems that might be difficult to unlock -- especially when you're in a hurry -- then the TL-50 might just be the gooseneck trailer lock for your needs. In conclusion, if you're looking for the best gooseneck trailer lock that offers ample security and convenience, you should definitely look at this product from Blaylock. It's ideal for shoppers who are looking for something that doesn't require too much fuss to use. ​In spite of this, it still offers adequate protection against trailer theft. ​However, if maximum security is what you're after, you might want to check out the next item on this list instead. ​Still, if an all-around and versatile lock is what you're aiming to buy, the TL-50 should tick off plenty of boxes. The fact that it isn't too expensive makes it a good choice for those who do not like to spend too much on a gooseneck trailer lock, as well. This high-security gooseneck trailer lock from Ft. Knox Locks puts its boltcutter-proof qualification at the forefront of its specs. Also, it fits most gooseneck couplers, including the new low profile Bulldog BX1 round drop tube (but not the square BX1 version), and both round and square drop tube style couplers. It is constructed using welded steel. 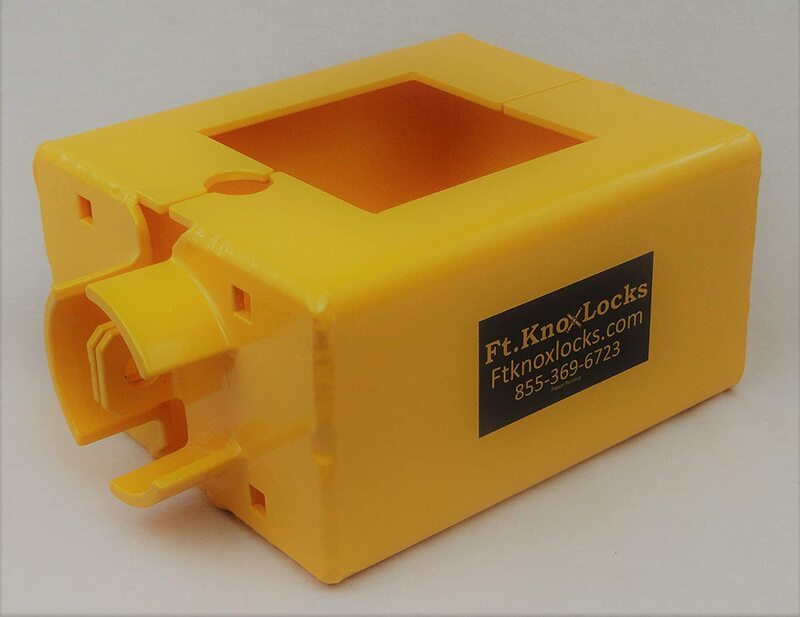 Lastly, with a bright yellow powder coat finish, this lock is definitely hard to miss. According to the manufacturer, only high power tools and a cutting torch can possibly stand a chance against this particular model. To add, it also comes with a limited lifetime warranty for all manufacturing defects, which is reassuring given the price tag that it comes with. People who've bought this gooseneck trailer lock seemed to really relish the fact that it's boltcutter-proof and very hard to remove. Although it is pricier than most trailer locks, ​the peace of mind that it gives makes it worth the money spent. ​The construction of this product is certainly ​heavy, and for some users the bright yellow aesthetic screams "highly-secure" and "impossible to steal" -- something that really helps ward off thieves. Although its heavy body makes it challenging to hold, it's not too hard to use it in general as far as locking and unlocking is concerned. The price tag on this lock can understandably discourage frugal shoppers. ​​However, if you're on the market for the most secure gooseneck trailer lock and you don't mind paying extra bucks for more peace of mind, then this Ft. Knox Locks product is the one for you. It provides solid protection, great aesthetics, and reliability in exchange for a comparatively-steep upfront cost. Already featured in our best trailer locks article, this gooseneck lock from Master Lock resists picking and prying through an advanced locking mechanism. Moreover, its design​ makes it easy to install and remove​​. ​Also, every single lock bought​​ comes with two keys. ​Because it fits 1-7/8", 2", and most 2-5/16" trailer couplers, this lock ​can be deemed as a pretty versatile bet. Furthermore, it's relatively lightweight for easier handling and transport. As a guide, the length of its bolt measures 7/8". ​Also, the locks are assigned a key code -- and each code corresponds to a specific type of key. This means that some pieces are keyed alike, which is a potential con for some users. ​Above all, it's worth noting that this product comes with a limited lifetime warranty for added peace of mind. 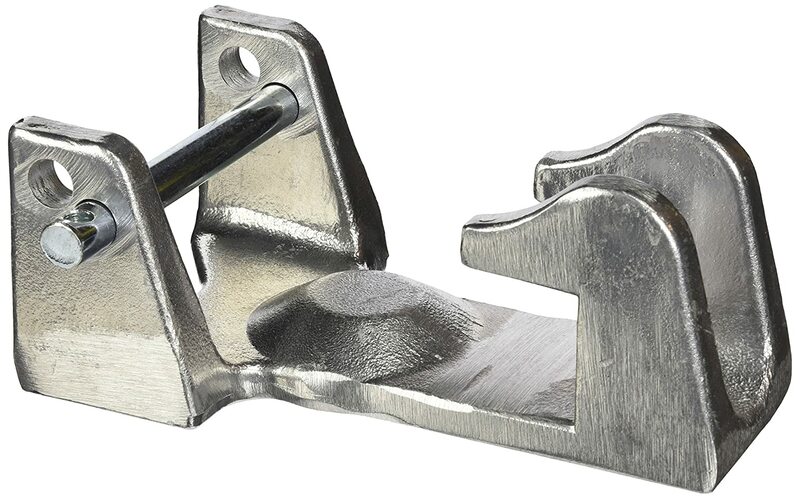 One Amazon buyer noted that this product is strong enough to resist hammering and prying after an intruder unsuccessfully forced off this lock from his trailer. Likewise, many other customers expressed that they were pleased with how strong and solidly-constructed this gooseneck trailer lock is. 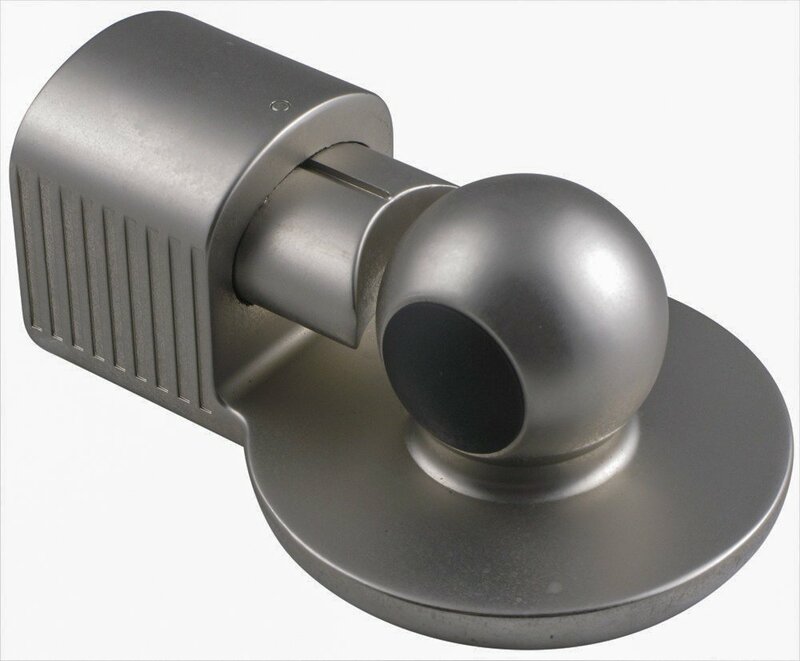 ​Furthermore, its solid stainless steel design looks sophisticated enough to ward off thieves. ​It's also pretty easy to handle and install because ​the lock itself is quite small. Finally, the fact that it costs only a few dollars above twenty bucks is a massive plus, as well. ​In conclusion, this contender from Master Lock is a viable choice for people who are looking for the best value. ​It doesn't come with highly-attractive features like the gooseneck trailer lock models listed before it (such as a boltcutter-proof exterior), but it still gets the job done and secures your gooseneck trailer hitch without putting a massive strain in your pocket. The best gooseneck trailer locks should be strong, heavy-duty, and resistant to wear and corrosion ​because these features guarantee a high level of security. At this point, we all know that choosing the right lock is just as important as, say, choosing the best gooseneck hitch because all of them​ work together to ensure the best possible trailer experience. As a result, the options we've listed above all possess the aforementioned characteristics. ​​This is what makes them so great at protecting your trailer from theft. However, keep in mind that they have their own sets of pros and cons ​that you have to consider. Think hard about your budget, requirements, and trailer setup before shopping for your own. ​After that, you'll be able to determine the best gooseneck trailer lock for your own set of needs and requirements.